ATLANTA — One military widow battling cancer received the surprise of a lifetime when a well-known Atlanta Falcons player surprised her with Super Bowl tickets. 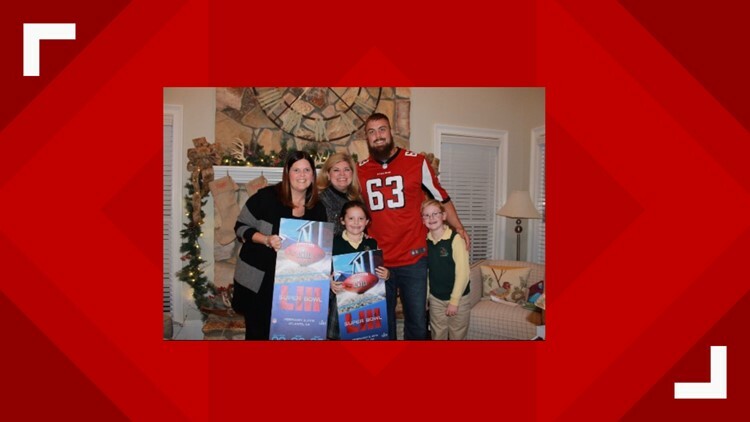 Falcons player Ben Garland showed up to Kammi Kennedy’s doorstep to deliver the tickets to her and her two children, Maggie and Brody. Garland wrote on Instagram, "Proud to be able to give three incredible families tickets to the Super Bowl. Big thanks to the NFL for helping make this happen. #inbrotherood #salutetoservice"
Kammi lost her husband, Major Thomas Kennedy, in 2012, while he was serving in Afghanistan. Since then, she has not let her sadness or illness stop her from giving back to the community. Kammi hosts an annual memorial golf outing, dinner, and silent auction to benefit Children of Fallen Patriots Foundation (Fallen Patriots). Her mission is to provide college scholarships and educational counseling to military children who have lost a parent in the line of duty. Donors and participants of her program have shown their support and helped Kammi to raise more than $140,000, which will allow her to gift student scholarships for the next 22 years. She says she is hopeful these funds will positively impact the lives of Gold Star Spouses, which is a name given to military spouses who have lost their partner in the line of duty. Now, this meetup may have come as a surprise to Kammi, but not to her Fallen Patriots board. Steve Cannon, board member of Fallen Patriots and CEO of AMB Group (in charge of all business operations for the NFL’s Atlanta Falcons), coordinated the surprise with Garland. The release says that Cannon was inspired to give Kammi tickets to the Super Bowl because he wanted to do something special for a brave woman who lost her everything in honor of this country. The family loves football and are really looking forward to their night out, according to the release.